This article is about devotional worship in Christianity. For the area in Singapore, see Novena, Singapore. For the open-source computer, see Novena (computing platform). A novena (from Latin: novem, "nine") is an ancient tradition of devotional praying in Christianity, consisting of private or public prayers repeated for nine successive days or weeks. During a novena, the devotees make petitions, implore favors, or obtain graces by worshiping Jesus Christ, and asking for intercessions of the Virgin Mary or the saints of the faith. Individuals may express love and honor by kneeling, burning candles or placing flowers before for the person represented by a statue. In some Christian communities, the popularity of novenas has waned, in others such as in Africa, Latin America and the Philippines, novena traditions are popular and include devotional rituals such as congregational prayers, statue decoration, hymn singing with music, as well as community fiesta events over beverages, refreshments or processions. Novenas are most often prayed by members of the Roman Catholic Church, as well as by Anglicans, Eastern Orthodox Christians, and Lutherans. In addition, novenas have also been used in an ecumenical Christian context, such as those promulgated by Premier Christian Radio in an effort to pray for Church renewal. The prayers are often derived from devotional prayer books, or consist of the recitation of the rosary (a "rosary novena"), or of short prayers through the day. Novena prayers are customarily printed in small booklets, and the novena is often dedicated to a specific angel, saint, a specific Marian title of the Blessed Virgin Mary, or it invokes one of the personages of the Holy Trinity. In the Catholic tradition, much used novena prayers include doctrinal statements in addition to a personal petition. The doctrinal part of the prayers are studied by its ecclesiastical staff, like formal translations of Christian scripture, and officially declared to be free of doctrinal errors with Nihil obstat and Imprimatur. The word Novena is rooted in the Latin word for nine. The practice of the novena is based in early Christianity, where Masses were held for nine days with devotional prayers to someone who has died. The practice may trace its origins to an early Greek and Roman custom performed by families, consisting of nine days of mourning after the death of a loved one, followed by a feast, which originally prompted Catholic writers such as St. Augustine, Pseudo-Alcuin and John Beleth to warn Christians not to emulate the custom. Over time, members of Roman Catholic faith began to associate novena with Christian themes such as the nine months Jesus spent in the womb, the giving up of His spirit at the ninth hour, and the event which occurred in the Upper Room with Twelve Apostles and the Blessed Virgin Mary when they prayed for nine days until the Holy Spirit descended on the Feast of the Pentecost. In the New Testament, this biblical event is often quoted from Acts of the Apostles, 1:12 – 2:5. The Church Fathers also assigned special meaning to the number nine, seeing it as symbolic of imperfect man turning to God in prayer (due to its proximity with the number ten, symbolic of perfection and God). The practice of novena grew by the Middle Ages to include pious prayers for nine days before a feast in honor of a saint identified on a liturgical calendar. By the 11th century, the novena practice had become a means in Christianity of praying to petition spiritual or personal favor through a saint, such as Virgin Mary. After the Reformation and Counter-reformation era, the Catholic Church formally approved novenas, in particular through the papal approvals of a large number of novenas by Pope Pius IX. Within the Roman Catholic tradition, novena prayers typically include of a praise of the Virgin Mary, Jesus Christ or saint, acknowledgment of the Christian doctrines, and a personal petition. Other than the petition, the rest of much used prayers used in a public setting is studied by the clergy and then approved to be free from doctrinal and moral errors. The approval is given in the form of an Imprimatur, Nihil Obstat, and Imprimi potest. These ecclesiastical approval are usually granted by a bishop or any ranking prelate for publication and approval. Novenas have been a widespread practice in Catholic history. Novena prayers are also practised by Lutheran, Orthodox and Anglican Christians, who hold close or similar beliefs regarding its pious practice. In addition, novenas have also been used in an ecumenical Christian context, such as those promulgated by Premier Christian Radio, in order to pray for Church renewal. The statues of Jesus Christ and Virgin Mary at a church consecration. A novena is a ritualistic devotional worship where one or more Christian devotees make petitions, implore favors, or obtain graces by honoring the statue of Jesus Christ, Virgin Mary or the saints of the faith who are believed to empower divine intervention. According to Fenella Cannell – a professor of Anthropology specializing in Christianity, a Novena is "a supplicatory act of worship". 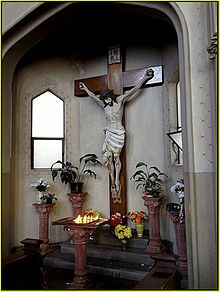 In Christian communities of Philippines and Latin America, novena traditions include devotional rituals in front of an altar, with nine levels where the Holy Cross is placed at the top. These are lit up with candles, decorated with flowers and other ritual items. Additionally, the space may have many statues decorated, and these statues typically include those of Virgin Mary, Apostles and saints of regional significance. The first day, the votive candles are placed on level one, and with each day the candles are raised by one level towards the Holy Cross. Further, each day includes congregational prayers, hymn singing with music, private and public devotionals. Some novenas include, sometimes on the last day, community fiesta events over beverages, refreshments or processions. Rosary Novena is linked to religious death rituals. Among the Filipino Catholic Christians, the Rosary Novena has been a prayer practice for nine days starting the day when someone dies, with formal funeral services timed to the ninth day. Elsewhere, the day of funeral service or when the body is interred is timed to local customary practices, while the nine day novena is held at the home of the deceased as elsewhere. Various denominations of Christianity in Africa have introduced regional novena practices that offer devotional prayers, clapping, waving, singing and shouting together in front of statues. However, some practices are unique to Africa. For example, the novena devotionalism in Ghana includes on each of the nine nights, after the loud prayers, the blood-covering of Jesus, where the devotees stain themselves considering it to be symbolism for the blood of Christ. Their [Catholic clergy] healing sessions are theatric, hysterical, loud and really engaging to the extent that some people fall to the ground and others feel the power of God piercing through their bodies. Some of the strong willed Catholics have taken up Novena after Novena seeking divine intervention in a sickness or misfortune. In short, there is a great yearning and thirsting for a religion that delivers quick answers to people’s problems which range from misfortunes to dealing with illness and death. Novena practices were introduced into communities by Christian missionaries in their colonial era and postmodern era proselytization efforts in Africa, as well as new world plantation colonies where African slaves were settled such as in Brazil. These initiatives brought a sense of socioreligious community. Devotional and paraliturgical novenas have been common in Europe as well as European settlers in North America. These have included public worship such as Mass and private praying with religious items such as a rosary and images particularly related to the Virgin Mary. According to James M. O'Toole – a professor of History specializing in American Catholic history, the period between World War I and mid 1950s were the "heyday of American Catholic devotionalism". This period witnessed novena devotionalism along with popularity of sodalities, confraternities, devotion to saints, meatless Fridays, holy cards, rosary, cross and eucharistic practices. These provided a sense of communal identification, states O'Toole, particularly in a time of mass migration. The novena had strong roots in ethnic neighborhoods, and devotional worship had sociopolitical links, offering a sense of communal security through religious symbols in a period of uncertainty and fear. As economic prosperity and a sense of national solidarity grew in and after the 1960s, the novena ritualism waned and the participation in church worship services fell. In Eastern and Central Europe, novena practices continue. For example, novenas among the faithful in the Czech Republic include nine hour prayers dedicated to the Infant Jesus of Prague, where the devotee can plead personal urgent needs before the statue of the Christ Child if he or she wants to, and on May 27 every year, the statue is ceremoniously paraded through the streets of Prague with prayers and songs. During the communist era, the devout orthodox Christians in the former Yugoslavia organized the Great Novena under the statue of Virgin Mary, to resist the state enforced atheism, to maintain the freedom to practice religion as a faithful feels appropriate, and to re-assert the Christian legacy of the region, particularly in Croatia. In Catholic Ireland, states Gladys Ganiel – a professor of Religion, devotional practices such as novenas have been popular. The cultural acceptance of devotional worship has been historically high, and those Irish who themselves do not perform novenas, nevertheless respect those who do. Some of their Catholic ritual practices were repressed by the British state during the 18th and 19th centuries, but repression and criticism only increased the resolve of the Irish to persist in their ways of practicing their faith. In North America, annual novenas are observed in some regions such as in Montreal, Canada, where between March 10 and 19 the annual novena ends in a feast of Saint Joseph. A religious survey published in the 1921 Bulletin of the University of Notre Dame, states that novena prayers were popular, and particularly common among students during examinations and during illness or after the death of a fellow student. The Novena-Seance remain popular in many regions of the United States, such as among the Roman Catholics of Louisiana where novenas are dedicated to St. Jude and the Virgin Mary. These novenas are prayers believed to create a contact between the saint and the devotee, and thereby invoke divine intervention in whatever problem or anxiety is important to the devotee. The novena has been an important part of Christianity in the Caribbean and Latin America, both among the native Indian communities who converted to Christianity under the colonial Spanish or Portuguese rule, as well as the diverse communities that formed anew from millions of slaves and indentured laborers brought to the Americas from different parts of Africa and Asia. The devotional prayers are dedicated to statues of Jesus Christ, Madonna and various saints. They are also a part of velorio (wake) after the death of someone, which includes nine nights of novena (rezos de los nueve días). According to Patrick Taylor and Frederick Case, the attendance to Christian religious services has been low, except after the death of a loved one or a significant socio-political individual, and during the times of difficulty such as epidemics or a drought. Many perform devotional worship with rosaries within their home before images of Christ and the Christian saints in a small dedicated altar within their living spaces. Like proselytism in Africa and Asia, missionaries of various denominations of Christianity, including Protestantism, have championed novenas in Hispanic-Latino communities as a part of their efforts to attract new converts to their ministries. Novenas are still a common sight in India, especially in the state of Kerala. They are practised by Roman Catholics and oriental Catholics (like, Syro-Malabar Catholic Church|Syro-Malabar Christians]] and Syro-Malankara Christians), and by the Orthodox Christians (Malankara Orthodox Christians and Jacobite Orthodox Christians). Novenas are common to Mother Mary (recited every Saturday), Saint George (common by the Orthodox and recited every Wednesday), Saint Jude and others. Novena rites are common in Filipino churches (left); a Novena Mass at the Basilica del Santo Niño in Cebu. Novenas remain a popular devotional practice in the Philippines. It is observed, for example, in the Simbang Gabi immediately preceding Christmas, and the novena preceding the Feast of the Santo Niño de Cebú (Holy Child) on the third Sunday of January. The first nine days are marked with prayers, petitions and singing. During the main procession, the Santo Niño image is taken through the streets of Cebu City, with many people carrying their own replicas, decorated to their own tastes. In Loboc, Bohol, the most popular novena is dedicated to a Black Madonna statue, with each service called the Gozos, which includes a chanting of praises to the Virgin in Spanish and Visayan, dancing, choir recitals, and a feast with fireworks on the last day. In Manila, three popular novenas to Our Lady of Perpetual Help, Saint Jude Thaddeus, and the Black Nazarene are assigned to the last three days of the week. Each novena is associated with a particular shrine, and have all been approved by the Holy See. Some organizations have also begun offering the novena rituals online for devotees. The Novena to Our Mother of Perpetual Help is observed on nine consecutive Wednesdays in Baclaran. The Saint Jude novena on Thursdays invokes the apostle's status as the Patron Saint of Lost Causes, and is popular with students taking examinations. The Black Nazarene novena held on Fridays marks the journey of Christ with the cross to his crucifixion. The image, novena, and associated devotional practices have a large following. In 2011, over six million Catholic devotees flocked to the Black Nazarene procession in Manila alone. In 19th century Melanesia, the Christian clergy linked the end of epidemics such as the measles of 1860, and credited the survival of the communities after major disasters to the dedicated and great outburst of prayers to Christian icons, to "fervent novena". Similarly, the Black Madonna novenas in Luboc started after similar crediting by the Christian clergy that the island community survived after a severe epidemic of cholera because they made devotional prayers to the Virgin Mary (Madonna) during their time of suffering. ^ a b c "Novena: nine days of prayer with Premier". Premier Christian Radio. Retrieved 10 April 2015. Novena is an ancient tradition of prayer for nine days between Ascension Day and Pentecost Sunday. Premier is resourcing a Novena to invite the Holy Spirit to bring fresh renewal to the Church and calls on churches across the UK to take part in an ecumenical act of unity and prayer. ^ Dennis Schnurr (1998). Novena for Justice and Peace. US Catholic Conference Publishers. pp. 1–2. ISBN 978-1-57455-237-9. ; Quote: "Novenas are devotional prayers repeated nine successive times for special intentions." ^ William G. Storey (2005). Novenas: Prayers of Intercession and Devotion. Loyola University Press. pp. 2–3. ISBN 978-0-8294-2161-3. ^ Thomas Carson (2003). New Catholic Encyclopedia: Mos-Pat (2nd ed.). Thomson/Gale. pp. 465–467. ISBN 978-0-7876-4004-0. ^ a b James M. O'Toole (2004). Habits of Devotion: Catholic Religious Practice in Twentieth-century America. Cornell University Press. pp. 114–117. ISBN 0-8014-7255-5. ^ a b c Malena Kuss (2007). Music in Latin America and the Caribbean: An Encyclopedic History, Volume 2. University of Texas Press. pp. 163–164, 198–200. ISBN 978-0-292-78498-7. ^ Paul Gifford (1998). African Christianity: Its Public Role. Indiana University Press. pp. 96–97. ISBN 978-0-253-21204-7. ^ a b "What is a novena?". Catholic Community of St. Matthew & St. Bernard Church. Retrieved 13 April 2016. Though the novena is primarily a devotion used by members of the Catholic Church, it is also practiced by some Orthodox, Anglican, and Lutheran Christians. ^ a b Nicholas Patrick Wiseman (1878). The Dublin Review. Burns and Oates. pp. 251–252. ^ Brian Singer-Towns (2005). The New American Bible. Saint Mary's Press. p. iii. ISBN 978-0-88489-863-4. ^ a b c Paula Kane (2004). James M. O'Toole (ed.). Habits of Devotion: Catholic Religious Practice in Twentieth-century America. Cornell University Press. p. 96. ISBN 0-8014-7255-5. ^ Novena to Our Mother of Perpetual Help - Baclaran copy. with Imprimatur. ^ a b c James M. O'Toole (2005). Habits of Devotion: Catholic Religious Practice in Twentieth-century America. Cornell University Press. pp. 1–5, 17, 52–54, 94–95. ISBN 978-0801472558. ^ a b Jonathan H. X. Lee; Kathleen M. Nadeau (2011). Encyclopedia of Asian American Folklore and Folklife. ABC-CLIO. pp. 350–351. ISBN 978-0-313-35066-5. ^ Thomas Carson (2003). New Catholic Encyclopedia: Mos-Pat (2nd ed.). Thomson/Gale. pp. 465–468. ISBN 978-0-7876-4004-0. ^ Sosa, Juan J. (1982). "Illness and Healing in Hispanic Communities". Liturgy. Routledge. 2 (2): 64–67. doi:10.1080/04580638209408609. ^ Fenella Cannell (2006). The Anthropology of Christianity. Duke University Press. pp. 74 note 15. ISBN 0-8223-3646-4. ^ Jonathan H. X. Lee; Kathleen M. Nadeau (2011). Encyclopedia of Asian American Folklore and Folklife. ABC-CLIO. p. 376. ISBN 978-0-313-35066-5. ^ Paul Gifford (1998). African Christianity: Its Public Role. Indiana University Press. pp. 96–97 with footnotes. ISBN 978-0-253-21204-7. ^ Roy Moodley; Marguerite Lengyell; Rosa Wu; et al., eds. (2015). International Counseling Case Studies Handbook. Wiley. pp. 26–27. ISBN 978-1-119-09830-0. ^ R. Andrew Chesnut (1997). Born Again in Brazil: The Pentecostal Boom and the Pathogens of Poverty. Rutgers University Press. pp. 44–45. ISBN 978-0-8135-2406-1. ^ Patrick Taylor; Frederick I. Case (2013). The Encyclopedia of Caribbean Religions. University of Illinois Press. pp. 230–231. ISBN 978-0-252-09433-0. ^ a b James M. O'Toole (2005). Habits of Devotion: Catholic Religious Practice in Twentieth-century America. Cornell University Press. pp. 52–54. ISBN 978-0801472558. ^ James M. O'Toole (2005). Habits of Devotion: Catholic Religious Practice in Twentieth-century America. Cornell University Press. pp. 75–83, 95–98. ISBN 978-0801472558. ^ Norbert C. Brockman (2011). Encyclopedia of Sacred Places, 2nd Edition. ABC-CLIO. p. 237. ISBN 978-1-59884-655-3. ^ Vjekoslav Perica (2002). Balkan Idols: Religion and Nationalism in Yugoslav States. Oxford University Press. pp. 63–74. ISBN 978-0-19-517429-8. ^ Gladys Ganiel (2016). Transforming Post-Catholic Ireland: Religious Practice in Late Modernity. Oxford University Press. pp. 26–27. ISBN 978-0-19-107438-7. ^ Norbert C. Brockman (2011). Encyclopedia of Sacred Places, 2nd Edition. ABC-CLIO. pp. 480–481. ISBN 978-1-59884-655-3. ^ University of Notre Dame (1921). Bulletin of the University of Notre Dame - July, Series XVII, Number 1. The University Press. pp. 11, 32–33. ^ Claude F. Jacobs; Andrew J. Kaslow (2001). The Spiritual Churches of New Orleans: Origins, Beliefs, and Rituals of an African-American Religion. Univ. of Tennessee Press. pp. 62–65, 207–210. ISBN 978-1-57233-148-8. ^ Patrick Taylor; Frederick I. Case (2013). The Encyclopedia of Caribbean Religions. University of Illinois Press. pp. 513–514. ISBN 978-0-252-09433-0. ^ Isabel Zakrzewski Brown (1999). Culture and Customs of the Dominican Republic. Greenwood. pp. 71–72. ISBN 978-0-313-30314-2. ^ Patrick Taylor; Frederick I. Case (2013). The Encyclopedia of Caribbean Religions. University of Illinois Press. pp. 152–153, 229–230, 899. ISBN 978-0-252-09433-0. ^ a b Fenella Cannell (7 November 2006). The Anthropology of Christianity. Duke University Press. pp. 112–113, 145–148. ISBN 0-8223-3646-4. ^ Maxwell E. Johnson (2002). The Virgin of Guadalupe: Theological Reflections of an Anglo-Lutheran Liturgist. Rowman & Littlefield. pp. 126–129. ISBN 978-0-7425-2284-8. ^ a b Sally Ann Ness (2016). Body, Movement, and Culture: Kinesthetic and Visual Symbolism in a Philippine Community. University of Pennsylvania Press. pp. 66–67. ISBN 978-1-5128-1822-2. ^ a b Norbert C. Brockman (2011). Encyclopedia of Sacred Places, 2nd Edition. ABC-CLIO. p. 297. ISBN 978-1-59884-655-3. ^ Geoffrey Wainwright (2006). The Oxford History of Christian Worship. Oxford University Press. pp. 674–675. ISBN 978-0-19-513886-3. ^ Sun Sun Lim; Cheryll Soriano (2016). Asian Perspectives on Digital Culture: Emerging Phenomena, Enduring Concepts. Routledge. pp. 33–39. ISBN 978-1-317-55263-5. ^ Purita Echevarria De Gonzalez (2000). Manila: A Memoir of Love & Loss. Hale & Iremonger. pp. 22–25. ISBN 978-0-86806-698-1. ^ Jose Alain Austria (2012), Hijos de Enero 9: Quiapo’s Black Nazarene Procession as a Male Rite of Passage, Manila Journal, Volume 8, Number 1, page 15; Quote: "This year  approximately 6.5 million devotees flocked to Quiapo and the Luneta, joining the longest procession on record of sixteen hours." ^ Douglas, Bronwen (1995). "Power, discourse and the appropriation of god: Christianity and subversion in a Melanesian context". History and Anthropology. Routledge. 9 (1): 57–92. doi:10.1080/02757206.1995.9960870.